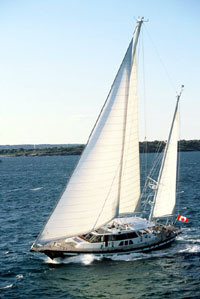 I am very pleased to announce the establishment of All Ocean Yacht's sister website ALL OCEAN SAILING YACHTS. Like All Ocean Yachts which specializes in world cruising, long range explorer yachts, conversions, brokerage, charter and new build, AllOceanSailingYachts.com is dedicated to world cruising sailing yachts starting at 70' to the largest mega sailing yachts in the world. My background as a captain started in ocean cruising sailing yachts and I was fortunate to have had the opportunity to run a number of world cruising sailboats. Like explorer yachts, world cruising sailing yachts should all have specific features and abilities that are not found in near coastal cruising sail boats and racing sailboats. Without question sailboats in general for their size are more sea worthy and sea kindly then equally sized motor yachts and as the size of the sailing yachts gets larger they tend to have more of the features needed by world cruising sailboats. Still, the fact remains that in each size category there are sailboats that are better suited for world cruising in remote areas than others. The team at ALL OCEAN SAILING YACHTS has the background and expertise to assist you in finding the right world cruising sailboat to meet your requirements so that you, your family and friends can cruise all of the world's oceans and explore remote areas in safety and comfort. The team at ALL OCEAN SAILING YACHTS looks forward to working with you.